A couple of years ago I was asked to create a series of granite culptures for a new housing development in Quorn in Leicestershire. Few people will know but merely a stones throw from this quiet Leicestershire village is the largest granite quarry in Europe. Most UK granite is found in Scotland or down in Cornwall but there are sporadic outcrops including this one in north of Leicestershire. The stone is of course, being granite, extremely hard. It is mainly crushed and its durability makes for excellent road stone. You would have to be crazy to order 25 tonnes of the stuff start carving it. But thats what happened. Following a number of visits to the quarry, I selected 6 huge boulders weighing between 2 and 6 tonnes. The stone is blasted out of the ground, unfortunately that results in many of the pieces being severely cracked rendering them useless for sculpture so finding suitable blocks always takes time. The blocks that I eventually chose were stunning, pink in colour and purple when wet. 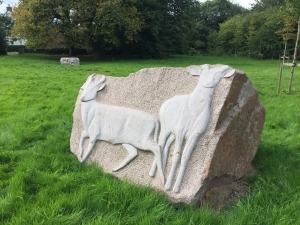 The designs for the granite sculptures were generated during community workshops and consultations. We decided to celebrate the flora and fauna that the village was so proud of. It would include images of Muntjac deer, bats, foxes and flowers carved mainly in relief into the granite. The process of carving granite is very different to carving most stone. Use of angle grinders are essential to make early inroads into this most reluctant material. A brand new blade essential and short lived for each block. For the carving- forget slicing through the rock like you would a freshly quarried piece of Portland Limestone. Only vertical bashing with a beast of a blunt chisel makes progress. The stone does not chip and crumble to the floor, instead sharp shards fizz past your face at incredible speed. The rewards of persevering with this stubborn igneous monster are very worthwhile. The different finishes available, the sparkle of the quartz and the colours are stunning. 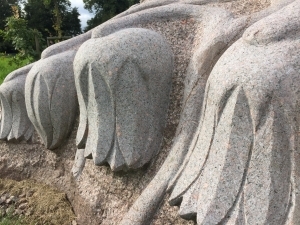 One final plus is that the granite does not absorb water like other stones, the benefit of this is that when you visit the sculptures, they have not weathered in the slightest and look like they could have been installed yesterday. Maybe worth the pain afterall.